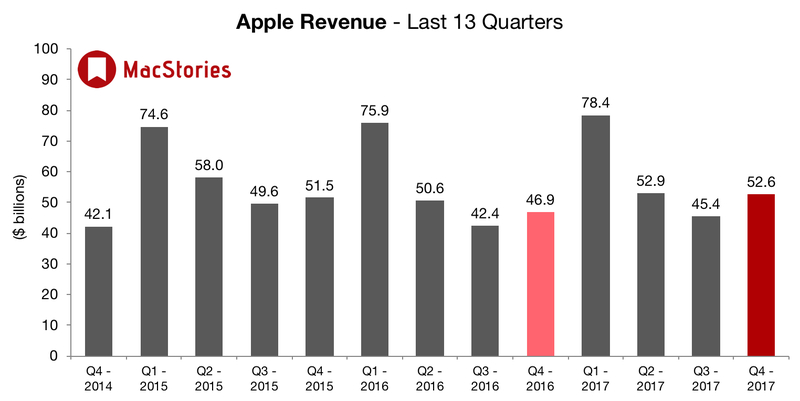 Apple's revenue guidance for Q4 2017 fell between $49 billion and $52 billion, with gross margin estimated to be between 37.5% and 38%. Apple is expected to report earnings of $1.87/share on $51.17 billion in revenue. Meanwhile, the so-called Whisper number is $1.93. The Whisper number is the Street's unofficial view on earnings. 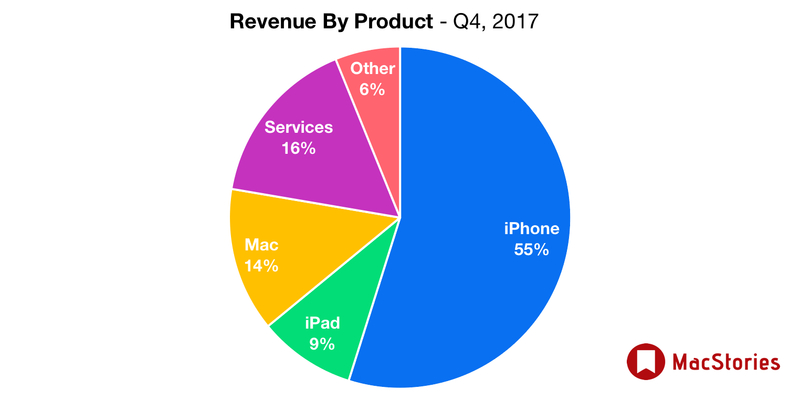 In the year-ago quarter (Q4 2016), Apple earned $46.9 billion in revenue. During that quarter Apple sold 45.5 million iPhones, 9.27 million iPads, and 4.89 million Macs. Below, we've compiled a graphical visualization of Apple's Q4 2017 financial results. iPhone 8 and 8 Plus are the two most popular iPhone models and have been every week since launch. Services are the size of a Fortune 100 company. Highest Mac revenue in history. Over 50% unit growth for Apple Watch for third straight quarter. 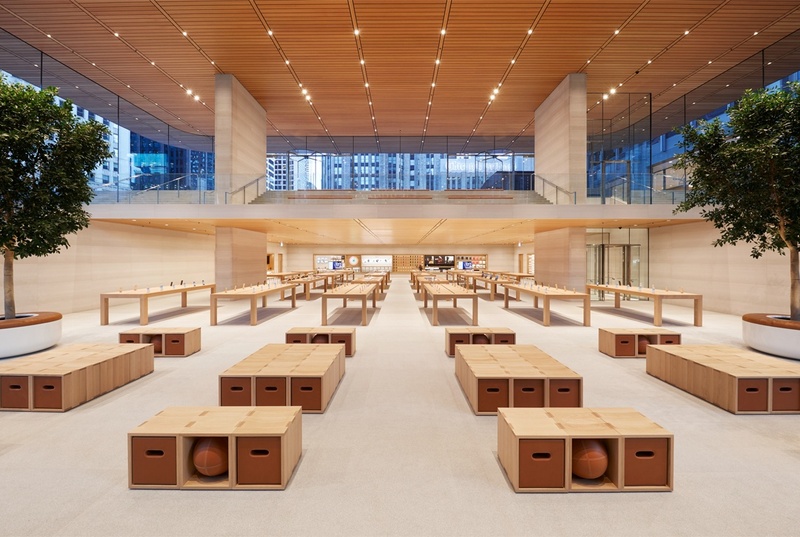 Chicago's Michigan Avenue store is the first store that brings together Apple's vision for Apple retail. iPhones up 3% over last year with many markets in double digits. Apple Music subscriptions are up 75% with increasing conversions from free to paid. Mac sales driven by MacBook Pro. 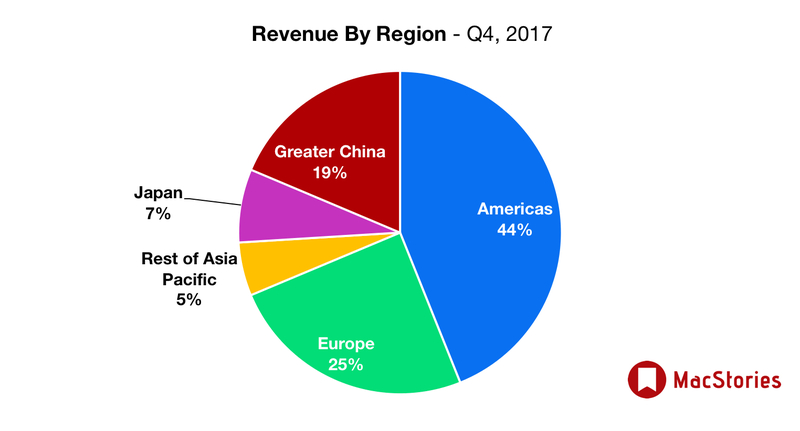 iPad unit and revenue growth are up world-wide. Quarter ended with $269 billion in cash. iPhone, iPad, and Mac market share increased during quarter in China. Tim Cook is excited about AR is because it amplifies human performance instead of isolation and it's mainstream. Apple’s wearables, now as big as any Fortune 400 company selling flops, were up 75%. Macs, which are despised by all users, grew 10% in units and 25% in revenue. Apple’s India revenues doubled y/y. Unlike followers of Mao, Indians don’t spend so much. 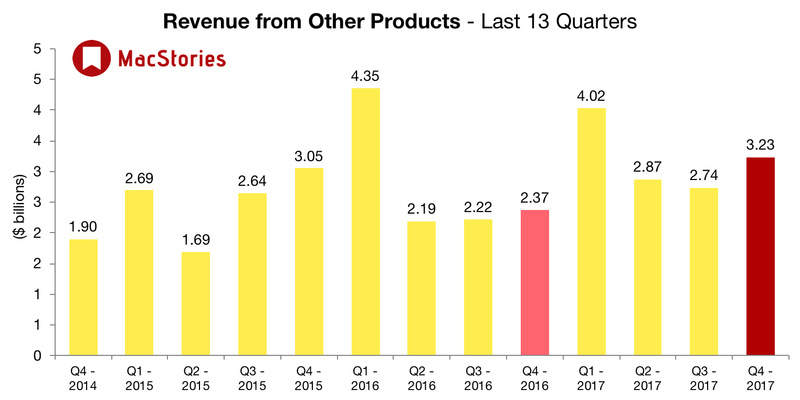 It seems Apple’s spending on R&D has gone up a bit, from 5.5% of sales in Q4 FY16 to 5.7% in Q4 FY17. 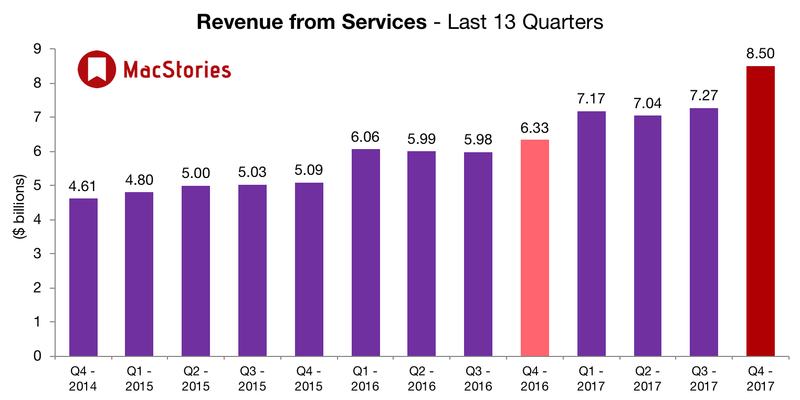 Apple's Services revenue included a one-time adjustment (that's why it looked unusually strong). Excluding charge = in-line w/ expectations. China, where Apple has lost to Huawei/Oppo, revenues were nearly $10 billion, up 12%. 46.7 million iPhones, 10.3 million iPads, 5.4 million Macs. iPhones shipments includes only about 1 week of iPhone 8 sales.